Another contributor suggested that greater transparency on execution performance would support wider market participation by investors, but also offered a caveat. “Transparency changes results – this is what MiFID II does. If we get better results for investors we get growth; if we don’t, we won’t,” he observed. “If we can lower costs for end-users that is good for industry. But the market has got to be competitive, fair and equal.” It was also noted that fast growth in SI market share beyond the 8-10% achieved by dark pools pre-MiFID II could weaken public confidence in the European equity market’s price discovery process. Roundtable participants cited a number of teething troubles with the new regime, notably in determining the addressable liquidity available from individual SIs, due to uncertainty over reporting and flagging issues. This makes it hard for brokers to update the routing logic of their smart order routers (SORs) in order to take advantage of new liquidity sources. However, speakers argued that such initial problems could and would be overcome over time, drawing parallels to the use of technology to increase transparency in other spheres. “Look at sports. When you introduce transparency, it never works the way it should first time, as football is experiencing right now. But given time, the issues can be addressed, as has been seen in tennis and cricket. After a few years, we look back and wonder how we could have lived without it,” observed one participant, adding that ELP SI operators had held informal discussions on providing greater transparency. Even with improved transparency, MiFID II’s SI regime is a significant change from previous execution mechanisms, requiring brokers to update and rethink their SORs while SI operators learn how to adjust their price feeds to different types of order flow. “SORs have not really evolved that much in recent years. So today the main conversation we’re having with clients are around data and transparency and stitching together a full picture of liquidity,” noted Ollie Cadman, Head of Business Development at Vela. Other participants agreed that achieving best execution for the end-investor remained a complex challenge under MiFID II, noting that execution performance via SIs rested on multiple factors which needed to be discussed and understood by market participants over time. While SI operators can tailor their price feeds to different types of buy-side order flow, execution quality also depends heavily on the broker’s trading infrastructure and approach to finding liquidity, he noted. Trading and execution experts around the table agreed that the nature of the change being brought about by MiFID II was still unknowable without more data, but expressed confidence that the first faltering steps toward transparency could bring substantial rewards to investors – and those that serve them. 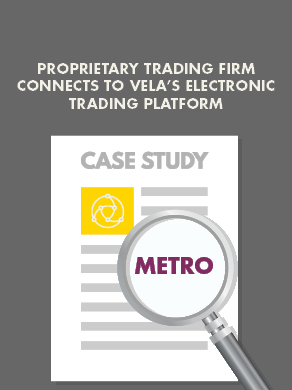 While accepting the scale of the data challenges facing the industry, Vela’s Cadman noted a contrasting and positive tone to that witnessed ahead of the original MiFID. “Ten years ago, exchanges were hoping MTFs would just go away. Now everyone’s around the table focusing on the end-investor – that’s a positive story that we can take forward into other areas of mutual interest,” he said.